There are hundreds of thousands of them if, you counted every Shisa on the island. The Shisa (Lion-dog) seen today are kiln fired clay or, plastic figures used as good luck charms. Throughout Okinawa they, guard gates, homes, bridges and offices, to ward off evil spirits. Often, they are sold to tourists on key chains and as jewelry. Often, they are brightly colored. To discover the origins of the Ryukyu Shisa, you'd have to go back a few centuries in history. On the main island of Okinawa a few dozen of the original Shisa may be seen. Remnants of the Ryukyu Dynasty, from the days Okinawa was an independent kingdom. A traveler would have to leave pavement in order to find them. Here are two, unique ones. Sculptured at some point during the 17th Century this statue sits on a hill in Yaese Town. The district of Tomori, experienced fires burning homes and crops, frequently. A master of the Chinese art, feng shui was consulted and a tour of the village was conducted. What advice, to give the villagers, had to be determined by surveying the terrain. Feng shui practitioners are sort of spiritual persons, with divine connections. Normal humans, can't sense, which direction evil spirits may be coming from. When the village elders and the guru reached this knoll, something happened. They were all sweating from, climbing the hill under a blazing hot sun. But, the master felt a chill, stopped perspiring and, got goosebumps on his body. Showing them an amulet, resembling a lion, he gave them instructions. A life-sized stone sculpture would have to be placed on this hill, facing the mountain. The evil fires, coming towards the hamlet, would cease and, the villagers would be safe. In the exact spot and facing in the correct direction, the Tomori stone Shisa was placed. It was the first Shisa, ever made on Okinawa island and, many more would follow. The fires in Tomori Village never happened again. Stone Shisa became legendary. They were used to ward off fires, plague, misfortunes and all sorts of evil, throughout Yaese. 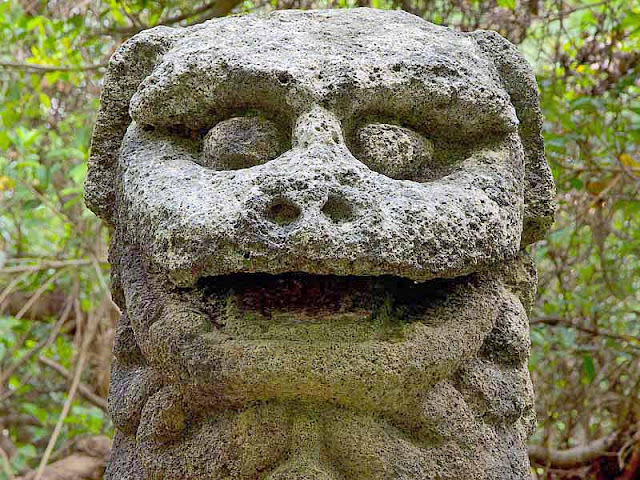 Before long Shisa statues were being placed in villages throughout the Ryukyu Islands. There are at least a dozen of these antique stones, to be seen in Yaese Town, alone. Most of them are off the beaten path, hidden from the average traveler's eyesight. Many local residents, don't know these treasures exist, in the neighborhoods where they live. 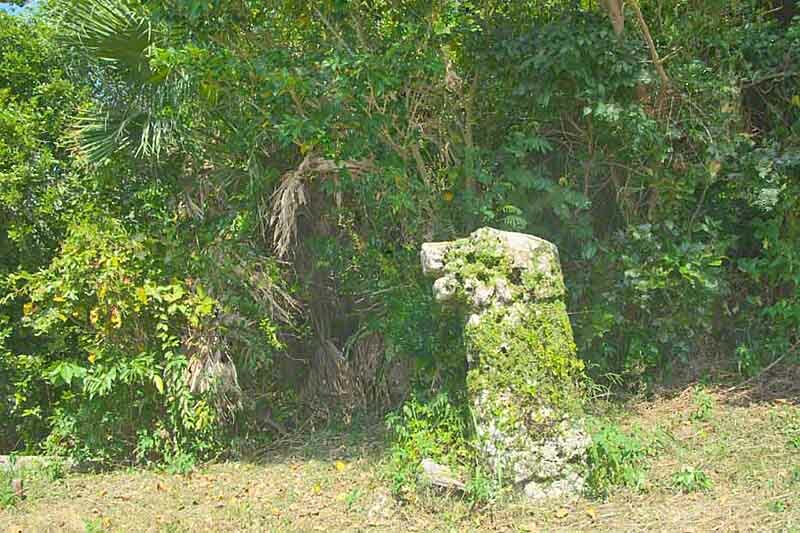 The Nise Stone of Kogusuku is on the travel map and, has some unusual folklore. It has been designated a Tangible Cultural Property of Yaese Town. It is different. Shisa or, Chinese guardian lion dogs, usually protect hamlets from fires or evil spirits. This Shisa was placed in its location, to ensure good fortune for young men. After being erected at this location, it brought prosperity to the young men of the village. To this date, on certain occasions, village officials and youth, come to worship here. It is also said if, a woman desires a boy child, she should touch this stone Shisa. NOTE: To find other original Shisa a local guide may be required.